So, fear not, as the solution is not that hard. This site aims at compiling the various info spread throughout the universe =) I personally repaired my cards with an old Olympus MAUSB-2 card reader and found it quite hard to dig up the correct links. So I hope that this sites makes it easier for you. By the way, much of the info here also applies to other memory cards. Before talking about corrupt SmartMedia cards, you are probably interested how to save your pictures that are still on the corrupt card, right? How do I recover images from corrupt cards? There are many tools available. They vary in price and effectiveness. I personally am satisfied with the SanDisk RescuePRO Tool that came with my SanDisk Ultra II CompactFlash card: Yes, the tool works also on other memory cards of other manufacturers! Inigo posted some info at the dpreview Olympus forum: forums.dpreview.com/forums/read.asp?forum=1008&message=4513656. Follow the instructions of installing and running that come with the programme and you should be ok. I noticed that when my card was not heavily corrupt, my SanDisk recovery tool did a great job. But once corruption grew stronger, the recovery did not work well. Different tools may be better for certain problems than others. The good commercial tools will provide a shareware version which shows you a only preview of what the full version can do. That way, it is fairly easy to "try before you buy". But check out the free versions above, first, especially PC Inspector's Smart Media Recovery. After you have saved your pictures from the corrupt card, it is time to repair it. Clean card with alcohol, insert wet card partially into your camera, slide it in and out numerous times. I must admit that I would be too afraid to try this! 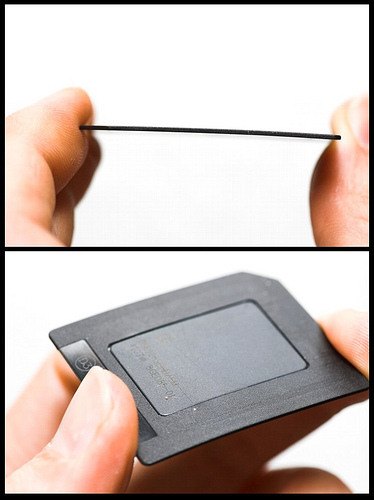 it is specifically designed to clean your camera's contacts and costs only 5 US$. How does my card get corrupted? Common theory is that some card readers create corruption when they are used to move/erase images on the card. You should use the card reader only to copy images and then delete the images from within your camera's menu. However, I have heard from many people who have never had any problems with their card in their card reader - it's your choice. I am not sure how my card got corrupted, but I assume it was when I was taking photos next to a very strong strobelight. Its electric and magnetic fields (it's an old scientific one) might have disturbed my camera when writing images to the card. Another possible reason for corruption is when the power supply malfunctions while a write-process is happening. Often you can fix it by formatting the card in your camera. Formatting in your card reader is usually a bad idea. So, if your camera cannot access the card, because the corruption is too bad, you are pretty lost. The old Fuji cameras are known for being able to format even those cards that cannot be accessed by the old Olympus cameras. So if you have a friend with an old Fuji, try this first. get a card reader with SMC chipset. Which ones are those, you ask? Well, mostly older readers. The most obvious may be the Olympus MAUSB-2 (download windows drivers here: downloads.olympus-europa.com/consumer/MAUSB/172/1.01sm2oly.exe, the old Zio (when Smartdisk was called www.ziocorp.com which was called Microtech) sdkbase.smartdisk.com/display/2n/kb/article.asp?aid=1191 drivers, Delkin eFilm Reader-4, and some others. The most current I know of (Thanks, Stef!) is the LDLC reader writer 9 in 1. Some more are listed on the above-mentioned site. Check the installation folder for a file called smprep.exe (for CompactFlash cards it is called cfrep.exe. If you can't find it, try installing the "ZIO! SM" drivers for your operating system from here: www.ziocorp.com/support/Microtech_Downloads.htm. You now should have a file called smprep.exe in the new installation folder. The panorama function will still work after formatting, when the CIS was not destroyed. There is no knowing the status of the CIS before trying to low-level format. If you do not have access to a suitable cardreader, you can contact me and I'll try to repair your card. I now can repair genuine Olympus cards, too, complete with their panorama function. You'll have to pay the (insured) postage for sending the card to and from Germany. In Late 2009 I moved and I do no longer have the possibility to repair cards. I will update again when I regain that possibility! Please read below for another option. Especially for people in North America, www.SmartMediaRepair.com offers a very fair price for repairing cards and even offers data recovery service. If you send a card, please use either the original storage case or trap the card by itself between two sheets of cardboard. They can break in the mail. When your card is bent (the upper shot) or shows cracks (lower shot), it is pretty questionable that the card can be repaired. SmartMedia cards to not like to be bent. Any mechanical stress, especially bending and twisting is bad. Of course, no card format likes that, but the thin and large SM cards are really sensitive. To prevent problems from this, always carry the card in the plastic container. Considering that SmartMedia cards are amongst the most expensive storage in $/MB today (2008), some extra care is well-advised.